Friday’s NCAA Tournament action included 28 matches, including four second round affairs. Just seven of those contests last longer than three sets and just three going the distance to a full five-set contest. 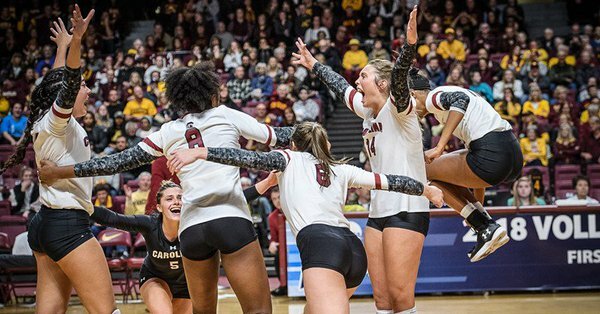 South Carolina edged past Colorado in a back and forth affair and Tennesee rallied from down 2-0 to defeat Colorado State in first round play. Among the four matches with a regional round berth on the line was a five-set thriller between Oregon and Baylor, eventually won by the Ducks by a slim 15-13 margin in the final stanza. The Sweet 16 berth is Oregon’s first since 2014. Joining Oregon in the Sweet 16 were tournament mainstays Florida, Wisconsin and Texas. The regional round appearance will mark the 24th in 29 previous tournament appearances for the Gators, the 13th straight for the Longhorns and the sixth straight for the Badgers. Florida swept FGCU, Texas swept in-state foe Texas State and Wisconsin got past Pepperdine in four sets. LMU outhit Duke .301 to .151 in the sweep. Sara Kovac piled up a match-high 22 kills, her seventh 20-plus kill effort of the season, while hitting .514 to lead the Lions. Ade Owokoniran led the way for Duke with 11 putaways on a .429 hitting effort. LMU’s Tess Reid managed a 35-assist, 11-dig double-double. The Cardinal posted their best hitting effort of the year with a .446 efficiency, while limiting Alabama State to a .108 effort. Stanford also outdid Bama State 10-1 in aces and 8-2 in blocks. Meghan McClure notched a match-high nine kills and nine digs for Stanford, while hitting .444. Tami Alade hit at a .778 clip with seven kills and no errors in nine swings. Alabama State was paced by Bayle Bennett’s eight putaways. The Vols earned their 10th second round berth and first since 2011 with the five-set win. The teams were tied at 11 in the final stanza, before Erica Treiber turned in two kills and a block over the final five points to seal the Vols’ win. Colorado State outhit (.227 to .203) and outblocked the Vols (18-11), but trailed 74-59 in kills and 6-3 in aces. Four players posted double-digit kills for Tennessee: Lily Felts (19), Tessa Grubbs (18), Treiber (12) and Addisyn Rose (12). Felts hit at a match-high .786 clip (12-1-14), while Madison Coulter notched a career-high 29 digs in the match. Brenna Runnels (21 kills, 10 digs) and Kirstie Hillyer (18 kills, .471) paced CSU. Washington State served up 10 aces (to 4) in the match and boasted the advantage in kills (62-48) and efficiency (.264 to .180). Four Cougars reached double-digit kill tallies led by McKenna Woodford’s 16. Jocelyn Urias served up four aces to go with her 13 kills and seven digs, while Taylor Mims added three aces to her 14 putaways and eight saves. Heaven Harris turned in a match-high 17 kills to lead NAU. Kara Bajema (16), Claire Hoffman (13) and Samntha Dreschel (11) led the way for Washington with double-digit kills and hitting percentages of .346 or better. Avie Niece notched seven of the team’s 15 blocks. Three Gaels also managed double-digit kill tallies: Lindsey Calvin (12), Sarah Chase (12) and Sienna Young (11). Alexsa Parker added a match-high four aces. Washington outhit SMC .360 to .213 and outblocked the Gaels 15-6, while each team served up 12 aces. Creighton served up four aces, giving the Bluejays a school-record 197 on the season. The Bluejays outhit the Coyotes .375 to .133 in part due to a 10-1 advantage in blocks. Taryn Kloth downed a match-high 16 kills on an errorless 23 swings, hitting .696 on the night for Creighton. Taylor Wilson (12) and Hayley Dotseth (11) paced South Dakota. Syracuse picks up the first NCAA Tournament win in program history in its tournament debut. Syracuse outhit Yale .347 to .198 with help from a 12-3.5 advantage in blocks. Paulina Shemanova notched 12 kills and 12 digs for the Orange, while Santita Ebangwese added 10 putaways on a .667 hitting effort. Yale’s Izzy Simqu turned in a match-high 13 kills for Yale, while hitting at a .440 clip. The sweep gives Penn State head coach Russ Rose 99 career NCAA Tournament victories, all with the Nittany Lions. PSU outhit Howard .474 to .000 and also registered a 9-2 lead in blocks and 7-0 advantage in aces. Eight Nittany Lions turned in kills in the match, led by Jonni Parker’s nine and Nia Reed’s eight. All eight players with a kill hit .250 or better, including seven at .389 or better. Courtney Dalton (5) and Indira Dandridge (4) were tops among the Bison offensively. Michigan advanced to the second round for the 13th time in program history with a sweep of Navy. Michigan bested Navy in every statistical category: kills (41-26), hitting efficiency (.250 to .053), aces (4-2) and blocks (9-8). Michigan’s Carly Skjodt led all hitters with 17 kills, while Kiara Shannon added six blocks. Kelsey Kingsland managed a team-high eight kills for the Midshipmen, while Sydney Shearn pulled up a match-high 22 digs. Pitt reached the 30-win milestone with the sweep, marking the most wins in program history since 19990 when the team went 32-6. Pitt advances to the second round for the sixth time in program history and third in a row. Nika Markovic posted her 1,000th career kill as part of a match-high 16 putaway effort for the Panthers. Claire Archibald notched 12 kills in her career finale for the Gaels. Pitt hit .306 and racked up 10 blocks in the win, while Iona managed seven stuffs and three aces, while hitting .098. Utah boasted a .310 to .211 advantage in hitting efficiency, but Denver held a slight 6-5 edge at the net in blocking. Dani Drews was one of three Utes with double-digit kills, turning in a match-high 18 to go with 12 digs. Becca Latham (13) and Lydia Bartalo (11) were tops among the Pioneers offensively. Despite the loss, Denver wraps up its best record in program history at 27-3. BYU doubled Stony Brook’s offensive output (37-18 in kills) and also led 8-2 in aces and 10-8 in blocks. The Cougars held the Seawolves to a -.034 hitting effort. Roni Jones-Perry notched 17 kills to lead all hitters for BYU. Kendra Harlow managed five putdowns to pace Stony Brook. Stony Brook’s final 21-9 record included the most wins in program history since 2007 (24). Louisville boasted the offensive advantage (50-33 in kills and .232 to .155 in efficiency), but Dayton led the match in aces (4-3) and blocks (6-4). Melanie McHenry and Amanda Green each turned in 15 kills to lead the Cardinals. Lauren Bruns was tops for the Flyers with eight putaways, but hit just .051 on the night. Illinois dominated the offensive side of the ball, outdoing the Eagles .455 to .066 in efficiency, while also boasting an 11-1 lead in blocks and 8-4 advantage in aces. Illinois hit at an error-free .812 clip (13 kills in 16 swings) in Set 2, while EMU hit -.115 (6-9-26). Jacqueline Quade and Ashley Fleming notched eight kills apiece to lead the Fighting Illini. Fleming hit at an .889 clip (8-0-9). Jordan Smith downed 11 kills to lead Eastern Michigan. Illinois State led 22-21 in Set 3, before Cincinnati closed out the night at 25-22 with three kills by Erica Kostelac and an ISU miscue to advance to the second round for the fifth time in program history. Both teams were efficient at the net with Cincinnati checking in with a .457 clip and Illinois State hitting .351 on the night. National kills per set leader Jordan Thompson downed a match-high 20 kills for the Bearcats, while Kostelac (14) and Maria Mallon (12) followed. Each hit .320 or better, led by Kostelac’s .650 effort (14-1-20). Kaylee Martin notched a career-high 17 kills, while Ali Line (11) and Marissa Stockman (10) followed. Stockman hit at a .750 clip (10-1-12). Marquette advances to the second round for the fourth time in program history and first since 2015. The Golden Eagles served up 10 aces and hammered High Point offensively (39-27 in kills on a .337 efficiency, while holding the Panthers to a .054 clip). Allie Barber downed a match-high 12 kills on a .407 hitting effort for Marquette, while Abby Broadstreet managed nine putaways for High Point. The six seniors on the High Point roster depart after leading the team to three straight NCAA Tournament berths for the first time in program history. The victory puts the Toreros into the NCAA second round for the third time in four years. Junior Torrey Van Winden did not play for the Mustangs in the loss, due to an injury suffered in practice earlier in the week. Cal Poly outserved San Diego 7-3, but trailed at the net: 61-45 in kills, 9-8 in blocks and .264 to .157 in efficiency. Lauren Fuller posted a match-high 22 kills for USD, while hitting .419 and adding eight digs, two blocks and an ace. Adlee Van Winden turned in 19 kills, six digs and an ace for Cal Poly. USC hit .427 in the match, including a .571 effort in Set 3, while limiting Samford to a .200 clip on the night. Emily Baptista (12), Brooke Botkin (11) and Khalia Lanier (11) paced the Trojans offensively in the victory. Kelsey Hobbs (12) and Krista Boesing (10) posted double-digit kill tallies for the Bulldogs. With the victory, USC earns a rematch of last year’s second round contest with San Diego, which the Trojans won in five sets. The teams have played in the tournament four times since 2010 (also 2010, 2015). USC is 7-0 all-tie against the Toreros in NCAA Tournament action. Missouri advanced to the second round for the fifth straight time (2013, 2015-18). The Tigers made just six hitting errors in the match, posting a .412 hitting effort, while holding the Wildcats to a .221 clip. Alyssa Munlyn hit at an .833 clip in the match (10-0-12), marking the highest individual match hitting effort in Mizzou postseason history (.765 by Na Yang on Dec. 3, 2005 vs. Arkansas). Munlyn was one of three Tigers with double-digit kills (also Kylie Deberg and Dariana Hollingsworth, 11 apiece). Paige Whipple (11) and Kendra Dahlke (10) paced Arizona offensively, while Julia Patterson turned in a 27-assist, 11-dig double-double. With the win, the Huskers reached the 25-win milestone (25-6) for the 18th time in 19 seasons under John Cook. Nebraska hit .352 in the match, while limiting Hofstra to a season-low .134 effort. Lauren Stivins downed a match-high 12 kills on a.500 hitting effort (12-3-18) for the Huskers, while Mikaela Foecke added nine kills and six blocks, while hitting .409. Laura Masciullo turned in 10 kills on a .241 hitting night for Hofstra. Purdue outhit ETSU .409 to .125 and also led the way in kills (45-34), aces (3-1) and blocks (7-4). Purdue hit at an eye-popping .700 clip, with just one error as a team in a 25-7 Set 2 win. Purdue advanced to the second round for the 13th time in its last 13 appearances, all under head coach Dave Shondell. Sherridan Atkinson and Grace Cleveland paced the Boilermakers with 12 and 10 kills respectively. Leah Clayton notched a team-best 11 kills for ETSU. Kentucky won its 22nd straight match and moved to 25-4 on the season with the sweep. The Wildcats hit .398 on the night, making just eight hitting errors, while the Racers hit .172 with 16 miscues. UK’s Leah Edmond led all hitters with 17 putaways, while Alli Stumler posted 12 kills and a career-high 15 digs and Brooke Morgan added 10 putaway on a team-best .667 hitting effort (10-0-15). Rachel Giustino (11) and Dacia Brown (10) managed double-digit kill efforts for the Racers. Giustino rounded out a double-double with 12 digs. Five Gamecocks posted double-digit kill tallies led by Mikayla Shields’ 19. Shields finished off a double-double with 15 digs, three aces and three blocks, while hitting .348. Four Buffs players chipped in double-digit kills led by Anyse Smith’s 17. Alexa Smith turned in a 16-kill, 13-dig double-double. South Carolina edged Colorado in kills (67-66), aces (9-8), blocks (10-8) and hitting efficiency (.294 to .261). South Carolina won the opening set 34-32 in its first NCAA Tournament match in 16 years. A reviewed call took away what would have won the stanza at 32-30. A Shields kill and a Buffs blocking error clinched the marathon set win. South Carolina picked up its 20th win of the season, marking the first 20 win season since 2008 and the 18th in program history. Minnesota used 16 blocks to limit Bryant to a .008 hitting percentage for the match. The Gophers hit .280 on the night with just seven hitting errors, to the Bulldogs’ 32 miscues. Alexis Hart downed 12 kills and added five blocks, while hitting .478 to lead the Gophers. Taylor Morgan just missed a double-double with eight kills and a team-high nine blocks. Julia Flynn turned in 13 digs and a team-best nine kills to lead Bryant. Caroline Kennedy set Bryant’s Division I season record for kills with 409, including five in the match, besting Maria Scocca’s mark which had stood since 2009.